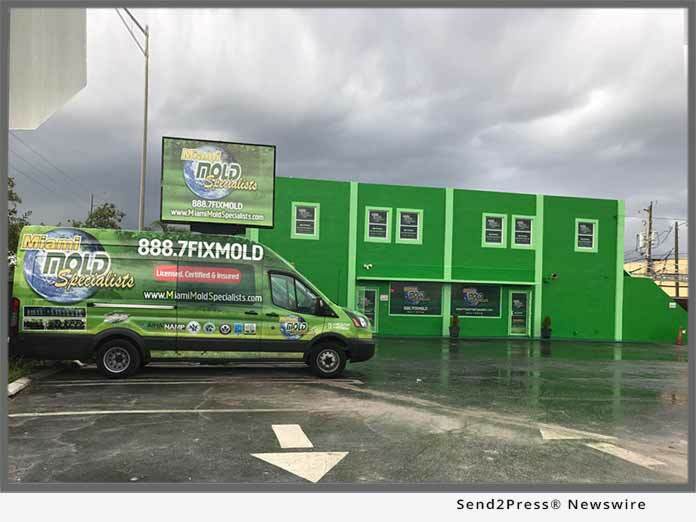 MIAMI, Fla., Jun 25, 2018 (SEND2PRESS NEWSWIRE) — Prominent indoor environmental services company, Miami Mold Specialist, recently announced the acquisition of prime commercial real estate in South Florida. This new commercial property will be used as Miami Mold Specialists new headquarters, with remodeling and renovations already getting underway. The new headquarters will allow for Miami Mold Specialists to efficiently and effectively expand their brand, business, and assets without the headaches of renting and/or leasing multiple properties. Miami Mold Specialist has also recently hired on highly knowledgeable and experienced talent; seasoned customer service reps, office staff, and industry veterans that previously worked with the owners of Miami Mold Specialist for two decades at their previous business location in New York City, N.Y. As such, preparations are apparently just about set for Miami Mold Specialists new business and international franchise expansion plan. For more information on Miami Mold Specialist’s newest technological innovations, eco-friendly indoor environmental services, state of the art equipment, mold inspection and removal services, and/or franchise opportunities, visit- https://www.miamimoldspecialists.com/contact-us. South Florida’s Premier Indoor Air Quality and Mold Removal Service Provider – Miami Mold Specialist: High Tech and Eco Friendly Indoor Air Quality, Mold Inspection, 3rd Party “Conflict Free” Mold Testing, Mold Removal, Mold Prevention, and Water Protection Services by Miami Mold Specialist. Multi Certified, Licensed, Bonded, and Insured. Over 30 Years’ Experience!